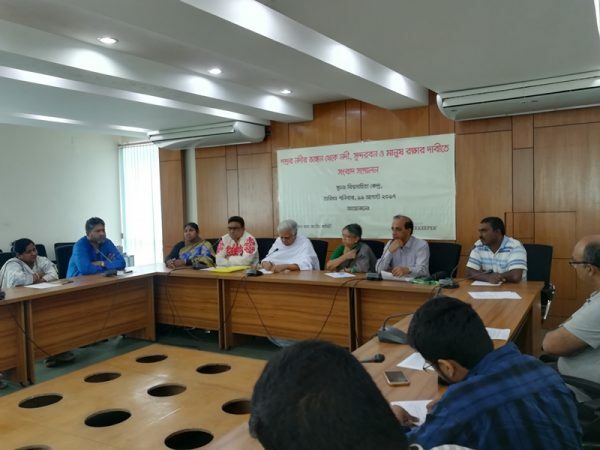 Press Conference on, “Saving the River, the Sundarbans and the People from Pashur River Erosion”. Pashur River Waterkeeper and National Committee for Saving the Sundarbans (NCSS) jointly organized a Press Conference on, “Saving the River, the Sundarbans and the People from Pashur River Erosion” on 19 August 2017, Saturday at 11:00 AM, at the conference hall of Bishwo Shahitto Kendro in Bangla Motor, Dhaka. Advocate Sultana Kamal, Convener of the National Committee for Saving the Sundarbans, presided over the meeting while Mr. Noor Alam Sheikh, Pashur River Waterkeeper gave his keynote speech. Eminent civil society personality, columnist & Vice President of BAPA Syed Abul Maksud, General Secretary of BAPA Dr. Mohd. Abdul Matin, Buriganga Riverkeeper and Joint Secretary of BAPA Mr. Sharif Jamil, General Secretary of Chadpai Union Fishermen Community Mr. Abdur Rashid, Resident of Chadpai Union Kamala Sarkar also gave their speeches. BAPA’s Joint Secretary Mr. Alamgir Kabir and Mr. Humayun Kabir Sumon were also present at the press conference among others. 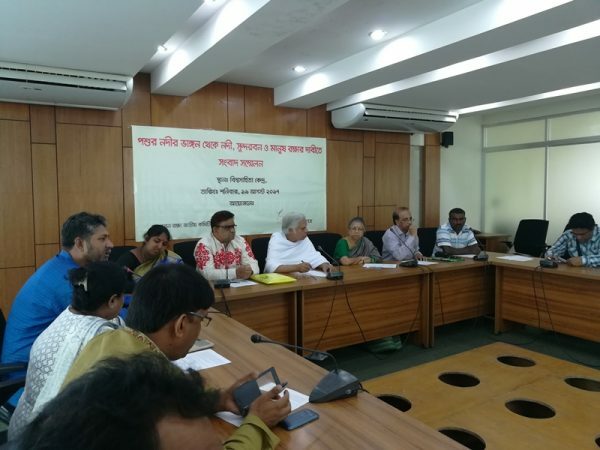 In the press conference, Human Rights Activist Advocate Sultana Kamal alleged that lives of people who live in and around the Sundarbans, are being jeopardized due to unplanned development and industrial works near the forest. So far, around 20 thousand people have lost their houses in erosion on both sides of Pashur River triggered by filling up of the creeks connecting to the river. Several village markets and important establishments were also lost due to the river erosion. These destitute people are moving to the cities and living in the slums, from where they are once again being evicted. “We did not want to see human life becoming endangered in this way in a country which earned its independence through war” She said. Syed Abul Maksud said that the government has approved establishment of so many industries beside the Sundarbans for the sake of the commercial intentions of a handful of individuals and businessmen, thus endangering a national asset over personal gains. The destruction of Pashur River due to unplanned development and industrialization has become a subject of extreme concern. Industrialization can never be important by destroying fisheries, forests, rivers and environment. Dr. Mohd. Abdul Matin said that Pashur River is a free-flowing river. This river is being threatened by wrong decisions and perspective. Due to unplanned industrialization, the water and fisheries of the Pashur River is under threat. It is unfortunate that 320 industries have been approved in the Sundarbans by the higher-ups of the Government a few days ago. Considering the rivers, the Sundarbans and the humanitarian issues, he demanded the government for the removal of all approved industries beside the Sundarbans. Sharif Jamil said, in last year, the abnormal erosion of Pashur River has destroyed many homes, including the Banishanta Bazar. Due to the destructive activities to the Pashur River, the people of this area have now been displaced. Therefore, immediate action is needed to protect the people of that area. The allocations for establishments upon Pashur River have to be cancelled as the government has promised to UNESCO that it would submit a report on technicalities regarding environmental aspects of the Sundarbans and adjacent areas. Hence such establishments, by no means, could be made before that.